Large_Booklet_Envelopes is rated 4.6 out of 5 by 32. Rated 5 out of 5 by Hopekaran from Perfect mailers I send my invoices to clients in red envelopes to help them stand out. This is my 2nd order with your company, and the deep red envelopes I purchase from you are really well made ~ thanks! Hello, I was hoping to order a sample of this envelope, 7.5 x 10.5, translucent . Is there anyway I can do that? Thanks. Hello, JAM actually has an official product samples policy. I have linked a web page describing our policy below. http://www.jampaper.com/Product-Samples.asp Thanks! What is weight of this envelope? The weight is 24 lb. Thanks for the question! You may be familiar with extra-large envelopes, but you have never seen a variety like this! Our Large Booklet Envelopes stand apart from average white ones, because they are offered in various bright, dark, and translucent colors. Reds, pink, blues, purples, greens, yellows- you name it- we have the color you seek. 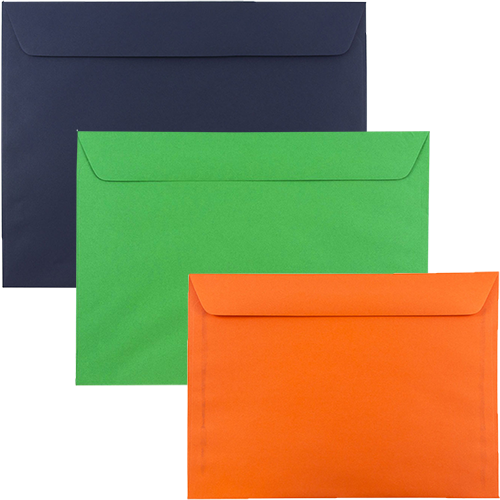 We have sweet pastels, energetic neons, refined darks, and everything in between for these open side envelopes. If you have a particular color in mind, you'll find it here. We’ve got it all. So you can get what you want in a large booklet envelope! Choose the color associated with your company or organization, a theme you’re aspiring to recreate, or just a color that your customers will find appealing. With all the direct mail out there, bold open side envelopes can make the difference between a hit or a miss. Our large booklet envelopes are essential!